Productivity, profitability and sustainability have become the essence of business survival; thus, modern industrial establishments are turning into frameworks consistent with environmental objectives by adopting cleaner technologies, green practices have ultimately resulting in generation of fewer pollutants. Urbanization and burgeoning technological advancement in different sector within India have brought the concept of green supply chain management, to highlight the importance of responsible consumption and production to maintain environmental quality, reduce wastage and bring out economic growth. This paper aims to segregate the sustainable and competitive performers from the average ones in the Indian manufacturing sector and to understand the degree of the impact of green practices of supply chain management based on their contribution towards sustainable environment. Using survey method, data are collected from 54 manufacturing organizations from Pune Nashik area, and a comprehensive framework of sustainability measurement is developed through successive applications of Chi-square Automatic Interaction Detector analysis, CHAID analysis. This paper is unique as it has applied the concept of CHAID analysis for first time to identify green logistics as main driver to achieve a reduction of ecological damage and improve business performance. The online version of this article ( https://doi.org/10.1007/s13243-018-0053-y) contains supplementary material, which is available to authorized users. We would like to express gratitude to our experts from corporate and academia that helped us in constructing and improving the research survey manuscript with their constructive feedback and providing insight and expertise that greatly assisted the research. We also thank our members of data collection team who supported our efforts with their keen involvement and enthusiasm and also all the respondents for their participation in the survey. We would like to extend our heartiest obligations to Deanship of Scientific Research (DSR), King Abdulaziz University, Jeddah, Saudi Arabia for providing support for this project under grant no KEP-10-135-39. 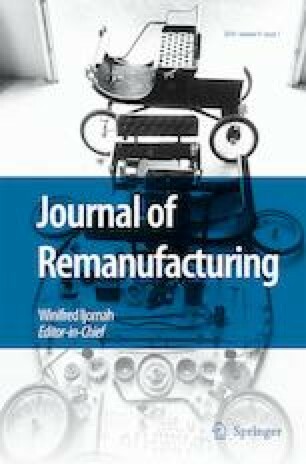 We are immensely thankful to Editor of “Journal of Remanufacturing”, Springer’s Publications, Germany and the anonymous reviewers for rigorous criticism in improving the quality of our study with their valuable recommendations.